Award winning tile contractor, Artisan Tile, has made a name for itself by tackling innovative, creative and complex installations. The Pinckney School of the Arts is no exception. Featuring tens of thousands of tiles of different size, shape and material, in addition to multiple 30-foot cello-shaped exterior pillars made of glass tile, the project presented unique challenges. To achieve this imaginative design, Jennifer Panning put her trust in TEC. “Early on, our TEC rep worked with our building team to help determine the best methods and materials for this challenging project. We’re extremely pleased with the results,” says Jennifer. A fine arts building addition at Pathfinder and Navigator Schools in Pinckney, MI contains more than 16,000 square feet of tile, all installed with TEC® products. The building addition houses fine and performing arts space, including a new band and orchestra suite, choir and music rooms, art rooms, a fine arts integration studio and conference room. More than 15,000 square feet of terrazzo, ceramic and porcelain tile is featured inside the facility. Terrazzo tile outfits the floor, ceramic adorns interior columns and porcelain creates unique interior benches. Outside, the Fine Arts Connector makes an especially artistic statement. 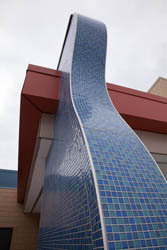 An additional 1,000 square feet of tile is featured on seven piers that are curved, designed to resemble the profile of a cello. Installing glass tile on the undulating piers created many challenges for the project team, so they turned to TEC brand products. “We were presented with several unique challenges on this project,” said Jennifer Panning, President of Artisan Tile, Inc., who served as tile subcontractor. “The combination of a 30 feet-high exterior application, using glass tile, various radiuses and a vertical substrate meant we needed products that could stand up to these challenges. We chose the TEC brand for this very reason – quality products and technical support."